Rebecca Eckler is a sharp and funny writer, well-known for her books and newspaper articles about single life and finding a man. After having kids with her fiancé, as she likes to call him, Rebecca started writing blogs about being a mother. Not surprisingly, Rebecca’s columns were outrageous, provocative, and laugh-out-loud funny. But some of her online readers didn’t think so. These mothers lashed out in a vicious way that surprised even Rebecca. So she decided to write about it, and we called the book The Mommy Mob. 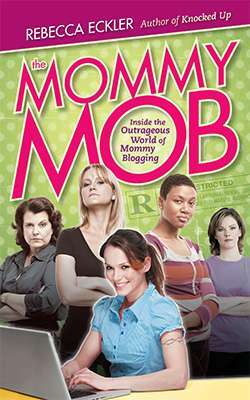 Now, The Mommy Mob has won a gold medal from the Independent Publisher Book Awards. It’s a huge win for Rebecca, especially after a year of attacks from the real life mommy mobsters who wrote venomous critiques in online reviews. It sounded like the kind of bullying Rebecca describes in her book. Now, The Mommy Mob gets its due: Rebecca’s book is a winner in the parenting category of a huge global competition, with over 6,000 books entered by more than 2,750 authors and publishers. When Rebecca came to Barlow, a team of editors and designers helped to bring her book to life. Jonathan Webb did a masterful edit to Rebecca’s manuscript. Tracy Bordian, our production editor, managed the production and design process to transform the manuscript in to files ready for the printer. The cover was a real collaboration between Rebecca and book designer Kyle Gell. Rebecca had a great idea — something based on The Sopranos, the popular TV show. It would definitely be out of the ordinary for the category, but Rebecca herself is out of the ordinary, so it made sense. Kyle took the idea and created a fun cover using hilarious stock photos that represented Rebecca and some of the types of bullies who go after her on the Internet. Rebecca contributed the idea of having the R rating on the cover. At Barlow Books, we are very proud of Rebecca and the whole team. It shows the high quality a new kind of publisher can achieve.